But the fact is that the reason the Republican Party is feigning righteous indignation is because they don’t want to talk about the 30,000 jobs lost and the 180,000 Oregonians who have lost health care,” said Neel Pender, executive director of the state Democratic Party. I’m in the process of slowly going through the old posts here and ensuring that all quoted sections have the <blockquote> style and that all posts have categories and post titles (because I was blogging before Blogger had a field for the post title, werd). One thing I’ve discovered (again) is perspective in that all the contemporary news and noise has its roots in the past, and also that we’re still quibbling over the same damn things fifteen years later. I forgot what exactly made me leap out of my bathtub and shout “Eureka!”, but I surely have discovered a scientific principle. Perhaps it’s all the Einstein and physics stuff that I have been reading but not really comprehending. But, my friends, I have come up with a scientifically proven system of awesomeness ranking. It’s like the Mohs scale, but of cool. You know how on the Mohs scale of mineral hardness, every item a step higher can scratch a mineral not as hard, but not vice versa? A diamond can scratch quartz which can scratch talc, but talc can’t even scratch an itch? Well, things on the scale of awesome can make things below them more awesome, but the lesser things do not improve upon higher things in the scale. Cool and all, but you know what makes them better? Goat yoga is definitely cooler than plain yoga. While some people might try to convince you otherwise through appeals to emotion, goats do not make everything better, as we will see. There might be a cultural bias in play here as I’m from Wisconsin, but cheese is more awesome than goats. Cheese on goat meat make it better–cheese makes all food better–but goats in my cheese? Not an improvement. A Mustang makes a weak man strong and a strong man invincible, or so the old slogan goes. Well, the one on the wall of Mustang Sally’s, a short-lived bar in the Central West End that I frequented, and by “frequented,” I mean “went to once,” when I owned a 1984 Ford Mustang GT. With a 5 Liter, V8 engine and five speed transmission. Ay, what a car for a young man to drive for about five months. Now, a driving a Mustang to the store for cheese? Awesome. Cheese on the Mustang? Are you kidding? Mustangs among goats? Awesome! A goat in a Mustang? Trouble, and not awesome at all, unless it is a modern Esmerelda and her goat, but that’s more a function of the awesome of Esmerelda than the goat. Fun fact: When I met my beautiful wife, a modern Esmerelda surely, I was driving the Mustang. Was it the poetry or the Mustang that won her heart for me? Bet on the Mustang. Metal music appears to be the strongest source of awesomeness on the planet. Listening to metal in a Mustang makes the Mustang better. Goats listening to metal probably provide better meat and milk (some experimentation still needed). To be sure, I’m not sure of anything that metal does not make better. These are representative of the levels on the awesomeness scale, which is not completely heirarchical in nature. Some things are on the same level of awesomeness as other things, of course. For example, coffee is probably a 1 on the Noggle scale, as there is nothing that it cannot make better. At any rate, here it is for scientific debate, and by “scientific debate,” I mean silly little conversations amongst friends. Or on the Internet if you don’t want to discuss it with your actual friends, who would think you daft for bringing this up. My boys just placed a small grocery bag containing the mostly decomposed remains of a small animal on my desk in hopes that I could identify it for them. They had disifected it by spraying it liberally with Lysol and apparently washing it before putting it, wet and very clean-smelling, into the bag. The youngest had sandwich bags on his hands and reached into the bag to get the remains out so I could have a better look at them before I demurred in a tone of voice that was not very demure at all. I have no idea what it was except an occasion to talk to my children about the sanitary handling of dead animals. That is to say: Don’t. This will not appear in a forthcoming post in the topic of Five Things On My Desk, I assure you. I picked this book from my to-read shelves because, whenever I turned around at my desk to talk to my beautiful wife, the red dot that indicates that it was a dollar book I bought from Hooked on Books once upon a time (probably before this blog existed, werd). I’m very conscious of the red dots these days since the current employees at Hooked on Books don’t know what they meant. So when it came time for a new fiction book, I finally settled on it, unsure of what I was getting. As it turns out, it is a British private detective novel. For a moment, I had some reservations given how little I really enjoyed my last British mystery (Cotswold Mistress from almost a year ago already). But this book’s tone is more akin to American private eye books with a British sensibility to them rather than an Agatha Christie ministers-and-gentlemen-dying locked room thing. The protagonist, January (called Jan) Esposito, is a bit of a ne-er-do-well loafing about in Italy and teaching English to Italian students. He’s got a hustler of a half brother, with whom he had a previous adventure that led them to believe he could be an adventure or private detective, so when the son of a gentleman goes missing, the Sir reaches out to the half brother, who enlists Jan to go to a small village in Verona to look for the young sir-to-be who is suspected of murdering a local. When Jan gets to town, he meets a young researcher who is not who she claims she is and some local toughts. It’s a pretty good read, a slower paced book than an American detective book even of that era, but it moves along nevertheless. Of course, Jan uncovers conspiracies and cover-ups that go all the way back to The War (World War II), a partisan plan to recover a religious statue stolen by the Nazis that goes missing when the Nazis burn the house where the partisans hole up after the raid, and a plot to arm a new revolutionary group planning attacks in the modern day. 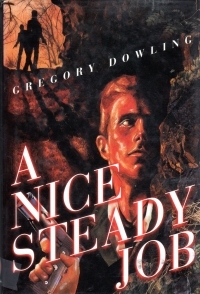 It gets a little convoluted at the end, but a lot of other detective books do get into their plots. A fun read, and certainly worth a dollar twenty years ago, although in contemporary dollars, that’s probably like $20. Probably still worth a dollar, and you could probably find it for that. 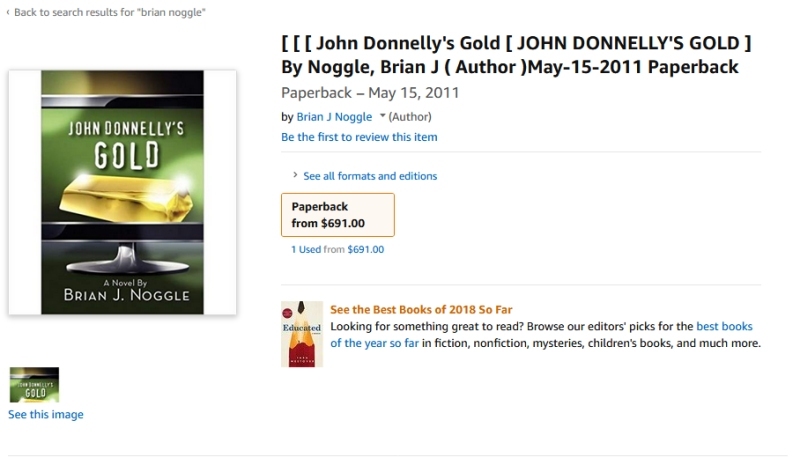 Apparently, this author wrote three books in the 1990s, of which this book is the last, and only recently returned to novels with a couple of historical thrillers set in Italy. Which probably means I won’t find a vast catalog of his other work in book sales here in town, but I will certainly keep an eye out for them. With the pretext of buying a gift card for a random stranger, I dragged my youngest son to ABC Books yesterday. I got said gift card (actually for the coach of the youngest’s spring basketball team) and bought the young son a couple of cartoon collections (Family Circus and the Far Side). I also got myself a few books. Socrates: A Man For Our Times by Paul Johnson whose books I’ve accummulated but need to read. Much like so many authors. What If? 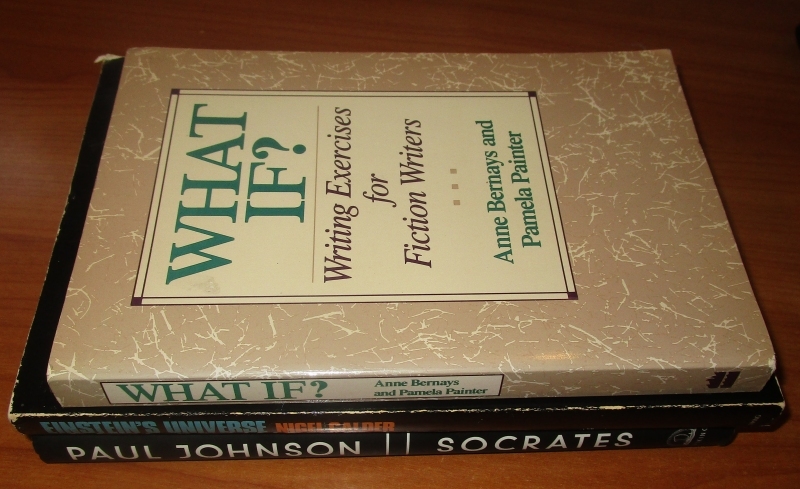 Writing Exercises for Fiction Writers by Anne Bernays and Pamela Painter because I keep meaning to get back to fiction and hope writing exercises and various writing journals I buy will help me get there. Instead, though, I keep typing up brief lists of books I’ve bought for a very selective Internet audience. Einstein’s Universe by Nigel Calder which looks to be based on a BBC/WGBH television series from 1979. 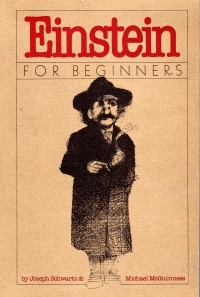 After reading Einstein’s Universe, I was looking for something slightly meatier and less Communist. A BBC production probably fits the description (without being entirely Communism-free, perhaps). I spent fifteen dollars on myself and about ten on the kid, so we kept it less than we spent on the gift card, so I’d like to call that restraint. I bought this book in April because I’ve been trying to get my head around higher physics. I’ve picked up, over the last year, a couple books that discuss quantum theory (The Physics of Christianity) and relativity (The ABC of Relativity). I nod along through several chapters, generally less than a third of the book (maybe just the title page and table of contents, come to think of it), and think, “I get this.” And then I come to a certain point in the book, and I am suddenly off the rails and have no idea what the author is talking about. So I thought maybe this book would help me. Little did I know this is just a comic book Communist biography of Einstein/indictment of the capitalist system of science and engineering. is Abby, as in Abby Jeanne. She’ll be at the Wisconsin State Fair this year, which is another festival I’ll miss in Milwaukee for the twenty-somethingth year in a row. To be honest, she falls outside of my preferred poles of songbird or heavy metal. The paper calls her rock, and maybe some of her live music rocks harder than the samples I find on YouTube, but she’s more bluesy rock with the F word kind of like Adele or Bonnie Raitt. 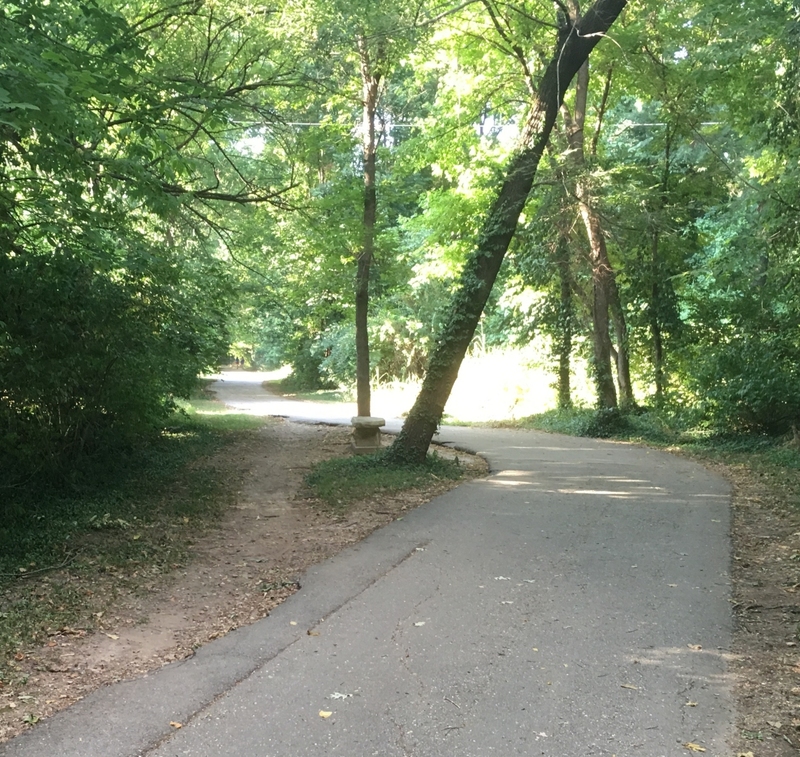 Walking the greenway out of Sequoita Park yesterday, I came upon two paths that diverged in the wood. To be entirely honest, I’m not sure I could suss out which was the less taken, either. I mean, the asphalt goes to the right, but enough people have traveled the slight shortcut to have worn a path there. Did more take the shortcut than walked on the laid path? Who knows? But it gave me something to think about as I took one of the two paths. 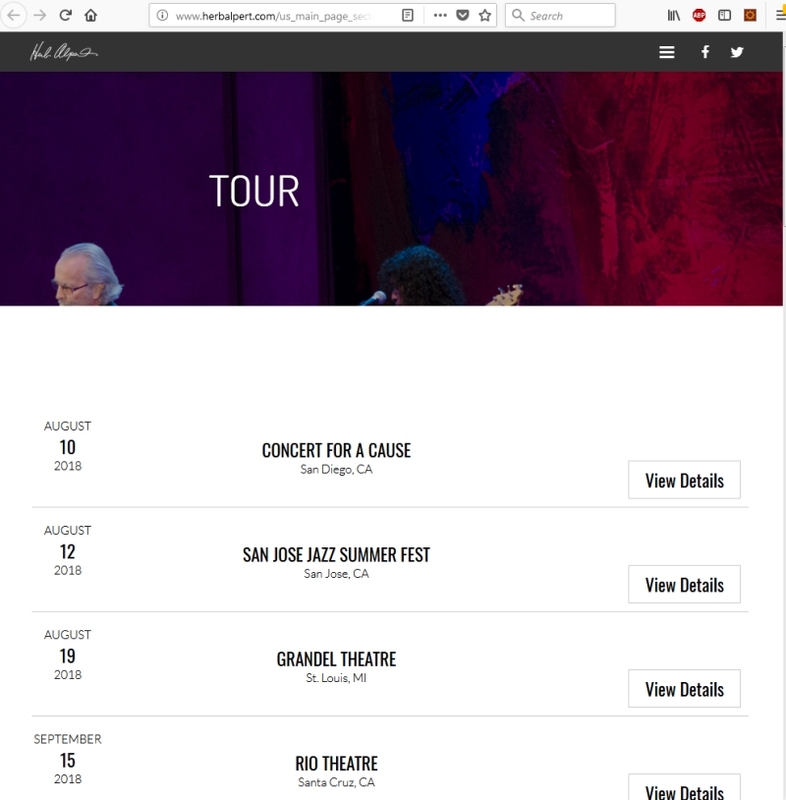 Herb Alpert shared on Facebook that he’s got some upcoming shows, so I clicked through to see if he’s going to be anywhere nearby. Oops. That’s a mistake on Herb Alpert’s Web site. Herb Alpert sells out the Grandel. Apparently, the Grandel Theatre is a new venue up by St. Louis University that opened in 2017, which explains why I was not familiar with the name. Well, I always have the concert I saw last year if nothing else. I’ve already booked our annual concert with a septugenerian. However, as it is a birthday gift for my beautiful wife, I will not divulge its exact nature in case she stumbles upon this blog in the next nine days. I had the usual time to kill between youth activities last night, and I know where all the Hooked on Books dollar book carts are, so I picked up a couple books. 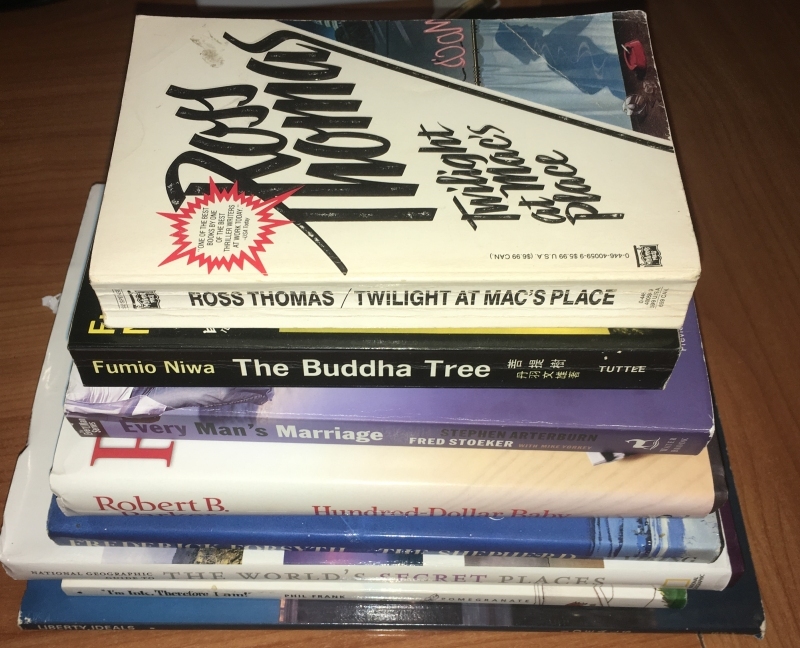 Twilight at Mac’s Place by Ross Thomas, whose books I’ve enjoyed, but not often. The Buddha Tree by Fumio Niwa, a classic translated from the Japanese. To go with my eventual Natsumi Kiyoura CD. Every Man’s Marriage: An Every Man’s Guide to Winninght the Heart of a Woman. Hundred Dollar Baby by Robert B. Parker. I’ve already read it, but I spent the dollar to make sure I have it in my incomplete collection. The Shepherd, a rather thin looking novel by the author of The Jackal, Frederick Forsyth. National Geographic’s Guide to the World’s Secret Places because it looks like a good book to browse if I watch any football this year, and a good source of ideas if not. I’m Ink, Therefore I Am, a collection of Farley cartoons by Phil Frank. Also for browsing during football and then for my oldest son to absquatulate with and destroy. Unfortunately, that only took twenty minutes, which meant we could go by Nameless City comics and games or the Ozark Treasures antique mall. I opted for the latter, as I expected I would spend less money there and could ostensibly look for Christmas gifts. As it stands, I spent two dollars on myself (I got an issue of Ideals magazine, “Liberty”, from 1984 and an LP, Eydie Gorme’ On Stage. And I did ostensibly get a Christmas gift for a cousin. So I’ve got that going for me, which is nice. Total spent: eight dollars plus tax on myself, six dollars on the cousin, and probably that much on regularly priced books at Hooked on Books for my children. Not bad. The real question is, which of these books will I read first (aside from Hundred Dollar Baby)? Probably the cartoons. How many will I have read by this time in 2020? Probably the cartoons. Silly Internet algorithm. You can buy it new on Amazon for $15.95 or on Kindle for 99 cents. Have you ever wanted to make a delicious chimichurri sauce for dinner using fresh herbs from your garden, but you can’t find your OXO Good Grips Salad Spinner because your kitchen-invasive husband has put it in the garage or–heaven forfend!–donated it to a charity garage sale because you haven’t used it in years? However will you dry those little parsley leaves? You don’t have little towels in that size! Never fear: You likely have an emergency salad spinner right in your laundry room! 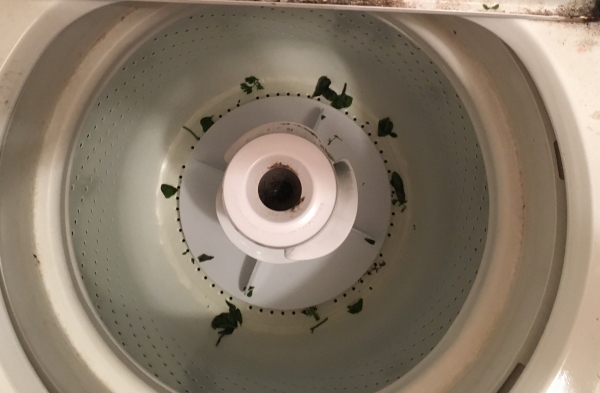 Running the herbs through your washing machine on delicate can easily wash and spin dry your herbs without you getting your hands wet! But don’t add oil and vinegar to your washing machine! It will just wash out with the water. Old washing machines without the child locks are the best, since you can just run the spin cycle. Tip: Washing them with denim helps to unlock the scents and flavors that are a key to chimichurri. I threatened to pick up the next Executioner novel, and, by golly, I did it. You and I must be punished! They’ve come a long way from the Don Pendleton days. They’ve become longer. They’ve jettisoned the page-long philosophical musings. The action has gotten more movie cinematic, and the tactics have gone out the window. Mack Bolan is no longer uber-competent–as a matter of fact, he’s kind of along for the ride. 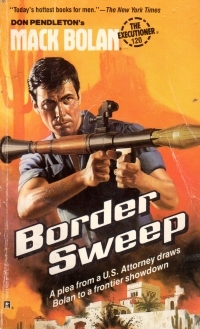 In a plot ripped from today’s headlines thirty years ago, Mack Bolan is called to Arizona to help an investigator down there who’s looking into human trafficking across the southern border, and Bolan slowly uncovers a plot where a master coyote is trying to organize both sides of the border to provide one-stop shopping for American agriculture who need cheap illegal immigrant labor and the high-tech transport to provide them. Overall, it’s a rather amateurish effort, although I guess the author was more professional than I am because he got a paycheck for his work. But it’s padded out to 250 pages by descriptions that aren’t done well enough in their writing to merit the space and that really bog down the pacing of the plot. The number of set pieces is pretty small, and they’re pretty far apart amid the Dungeon Mastering descriptions. And we’ve got whackiness that doesn’t ring true. Bolan shook his head, the sprinted toward the sound of gunfire. The deep bark of a carbine gave him hope that at least one of the border patrolmen was still alive. I’m not an expert on guns, but from my knowledge, you can tell more about the size of the hole in the barrel rather than the length of the barrel from the sound. What are the odds that a Mexican prostitute would have a German name rather than a Mexican one? Randy Carlton loved the desert and hated it with equal conviction. Its beauty was undeniable, but its hostility was implacable. He [Carlton] had always loved the desert. Whenever he thought about it, he would smile. The wispy gas coiled up in a thin stream, then vanished as it was sucked up by the whirling turbo fan. In a moment or two the bulk of the tear gas would be spewed, and the fan would be unable to handle the load. Bolan realized he had to do something, and do it fast. He brought the Skorpion around and zeroed in on the edge of the sphere, like a pool shark lining up a difficult shot. The slug just nicked the edge of the gas cannister and sent it spinning in toward Carlton. It vanished behind the turbine housing, only to come arcing back a moment later to bounce out into the hall, belching a thick cloud. If you’re wondering whether Bolan and the infiltrators had to cinematically traverse the huge turbine blades, shut your mouth. Of course they did! At any rate, the further I get into the series and the longer they get, and the worse the writing gets, the more I dread reading another one. And I have 37 Executioner novels, 10 Stony Man novels, 16 Mack Bolan, and 8 Able Team books in my collection to read. I recently picked up three books by Don Pendleton in another series he did about a guy named Ashton Ford. I’ll quite likely read these before I read another in the Gold Eagle sets. As you might know, gentle reader, I like to flip through the society pages of the local slick and browse through the equivalent gallery pages of the Springfield News-Leader because Springfield is a relatively small city, and I’ll often see someone I know attending some event. 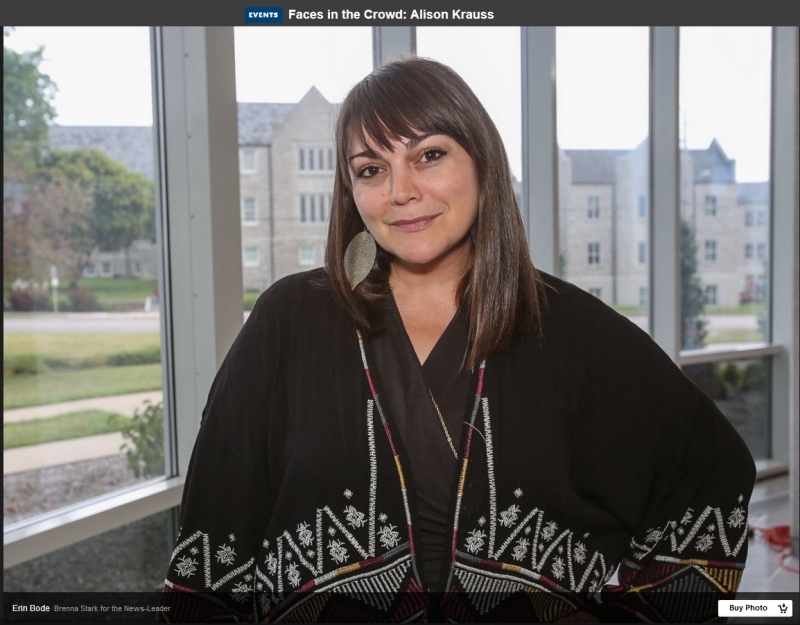 So yesterday, I’m scrolling through the gallery of people attending a recent Alison Krauss concert, and there, just like she were a mere mortal, was Erin Bode. That is jazz vocalist Erin Bode. I’m not sure the photographer from the News-Leader knows it. I’ve seen her twice in concert. Once at a little club in Clayton called Finale where I dragged my beautiful wife on a date night sans our only son at the time. The other was at the Old Trees annual musical festival, where I walked up without the family to catch a bit of her set. I got her 2006 album Over and Over and listened to it, well, over and over in the office where I worked five flights above Washington Avenue. Strangely enough, I don’t have any of her other albums. Which might mean that my musical purchase might become unbalanced in the coming months. I’ve used it with on and off frequency, but always full volume, for a couple of years, but it developed a bit of a glitch. Well, several, actually. It has a single switch on the side that is its power switch and determines whether to shuffle the songs on the playlist or to play them all in alphabetical order by artist. It started to play the songs in order regardless of the switch’s position. Then, it started to play if you pressed the play/pause button when the switch was off, which led me to some consternation the last time I was in the gym because it would stop playing after a couple seconds. Further inspection of the switch indicated that it was off, and when I turned it on, it worked better. This week, I had it out of the gym bag because I went for an ill-advised run outside of the YMCA, and I left it on the dresser in my bedroom (by the Montaigne). And it started playing on its own a couple of times, including once at 5:51 in the morning when I did not want to hear music that early. I’m so old that when I think of a switch, I think of a mechanical device that starts or stops something by moving actual parts. But in modern devices, especially the really small ones like an iPod, the switch is merely an input to the electronics of something, and often merely an input to software. So if the software decides that off is on, the device will be active when the switch is in the off position. Give me the good old days when the switches were actual physical things and when volume knobs were potentiometers. Of course, I could not clip a Pioneer or Kenwood hi-fi to my shirt while I run, but this iPod is breaking down to the point where it’s almost unusable, too, which means I’ll have to investigate and invest in another kind of MP3 player since Apple has decided that the iPod should really be an iPhone without cellular connectivity. Thirty years later, however, I’m reviewing the parents’ accused behavior to see what I can learn from it and apply it to my own children. Apparently, every time I find myself in Leavenworth, I have some time to kill, so I stop by the one used book store in the area (as I did last October). Whereas I bought four books up there last time I was in town, this time I only bought three (for myself). 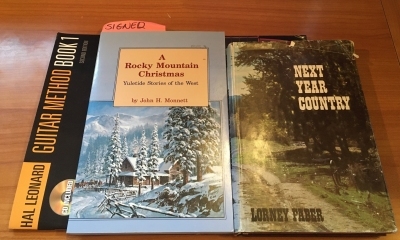 A Rocky Mountain Christmas, which is a collection of Christmas stories from the mountains. Which might be something to read for my annual Christmas book, although I’m buying so many in anticipation of my one Christmas-themed book per year that I might have to start reading more than one a year. Perhaps starting in July. Next Year Country, a collection of reminisciences about a farm in Montana. Also in my wheelhouse of books about living on farms in the old days. And by “in my wheelhouse,” I mean books I like to read from time to time, but that I buy a lot more of than I read. Which, basically, describes my book buying completely. Hal Leonard Guitar Method Book 1. As you might know, I bought myself a grey black guitar earlier this year and took guitar lessons for a couple months (suspending them because the instructor was moving into advanced stuff when I can’t change chords in time yet). I’ve been accumulating guitar books to work from for a while now, and I thought I had the second in this line. Turns out, I have the second book in the Fast Track Method series. I hope I don’t end the universe if I cross the streams. I also bought a book on the television show Dallas, to give to my aunt who loved the television show. I’d put in a link to the book I bought her, but I forgot the exact title, and I’ve already wrapped it. You know, if I held myself to a couple books at a time, I could maybe start making headway on reading my collection. I actually did have that as a New Year’s Resolution one year in the middle 1990s–that I would not buy another book until I read all the ones I owned. I had only a bookshelf or two, single-stacked, to read were I to hold the line. The resolution lasted about seven months, after which I joined a book club and bought like ten books. How cute, my older self thinks. As I might have mentioned, my boys and I are watching all the James Bond films in order. 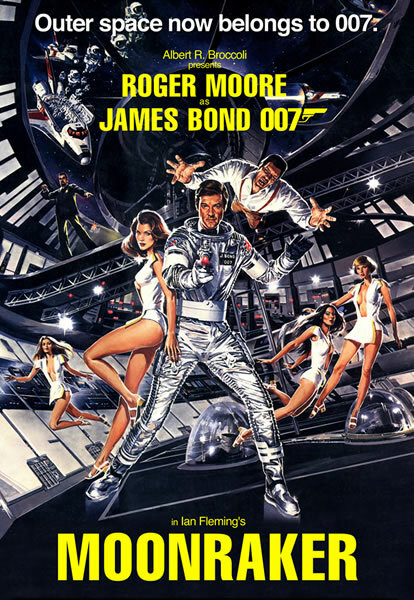 Last night we got to Moonraker, the most outrageous and outlandish film in the series which piggy-backed off of the box office success of Star Wars to inject a science fiction element to the series and features laser battles in space. It also was the largest grossing Bond film for a long time (he said, summarizing the Wikipedia entry). As my children watched it, they could not suspend their disbelief. Space shuttles, which were space craft that lifted off like rockets and landed like planes. Bent-nosed supersonic passenger airplanes that could cross the Atlantic ocean in three hours. Given that my oldest was born in 2006, he cannot remember such things, so perhaps he could not believe them possible. Well, after reading What If?, I did not pick up the next Executioner novel. Instead, I picked up this play that I bought at the very end of last year. It’s a single evening play in two acts by Thomas Stearns Eliot, the man most known in these parts for “The Love Song of J. Alfred Prufrock” (which I could recite and perform from memory in my Open Mic days). The play deals, as the title clearly indicates to anyone with a classical education, and oh, my God, that’s not many of us any more, is it?, the death of Thomas Becket at the purported “request” of King Henry II of England. Becket, who had been the king’s chancellor (tax collector in chief) before he became archbishop of Cantebury, opposed the king after he became archbishop. 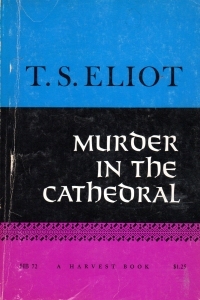 The first act of the play covers Becket’s return from exile to Cantebury, where his mere presence lifts the spirits of the downtrodden and the clergy, but Becket predicts his own martyrdom and is presented with various temptations: sensual pleasure, power, and finally, immortality in his martyrdom. While he resists easily the first and earthly ones, the last of them tracks with his secret desire. Then, in the second, when the knights are coming, Thomas does not flee and insists upon opening the doors to those who would kill him. After they do, the knights present their cases as to who really was at fault in his death. So I guess you’re supposed to wonder and talk about later whether Becket was doing God’s will or his own in the second act given the nature of his last temptation. But I’m a bit meh on it. The play is mostly in verse, some rhyming and adhering to standard rhythm and some not. However, the knights present their cases in prose. So clearly this is Drama, which means you go to the play to be educated and not entertained with a side of emotional response and later musing on the big themes that entertained you while playing out. So I liked it less than The Marriage of Bette and Boo. Or even The Oedipus Cycle or The Bird by Aristophanes because they’re old books translated from dead languages. This play is more akin to The Balcony by Jean Genet in that it’s Educational, but I forgive the Genet play more because it was in French, and Eliot wrote in English, following a rich tradition of playwrights who wrote plays enjoyable for themselves and not the IDEAS they PRESENT. Still, probably better than “The Waste Land”. What peace can be found to grow between the hammer and the anvil?